He’s not a cigar maker with a history of a Cuban family that has been growing and cultivating tobacco for generations. He does not wear a fancy hat, or ride a horse or wear a Guevara [sic] shirt like all the cliche ads in the cigar magazines. He is David Garofalo, an Italian American that was born and brought up in inner-city Boston, a man who has spent over 30 years as a cigar retailer and is obsessed with cigars. After more than half his life in the cigar industry, David has decided to launch his own cigar. The Garofalo blend is comprised of Jalapa and Esteli filler tobaccos and a Nicaraguan binder, cloaked in an Ecuadoran Connecticut wrapper. It is available in four vitolas, a 5”x50 robusto, 5”x54 torpedo, 6”x52 toro and 7”x50 churchill. Today’s review is for the robusto, which has launched with a $6.79 MSRP. The Garofalo has moderate veining and a lightly colored wrapper that telegraphs every underlying bump, giving it a somewhat rumpled appearance. The samples I received were slightly soft but evenly packed with no voids nor dense spots. Once clipped, the draw was just a bit more open than I would deem perfect, but certainly within normal expectations. The cold draw provided a mild hay flavor, while the unlit aroma was sugary and sweet, eliciting associations with molasses and sweet oats. The initial puffs were surprisingly filled with a bright spice; not a spice such as comes across aggressively on the palate, but predominantly felt through the nose on retrohale. The cigar took to fire quite readily – in fact, it lit amazingly quick and even. From the beginning, it produced no small amount of smoke. Throughout the first third of the cigar, a general nuttiness prevails as the dominant flavor. There were a few occasions when a slight vegetal note would come through, but they were sporadic and fleeting. By the end of this first third, a bit of sweetness has crept in. I should note that I paired some plain, black coffee with one of the samples, which seemed to amplify this sweetness. Generally, when I smoke Connecticut-wrapped cigars, I like to at least try them in this way. I find the crisp, cedary coffee will often provide a backdrop that really brings the sweetness out in the leaf. Breaching the second third of the Garofalo, I grew a bit more impressed with its construction. I had some initial reservations with the each of the two samples, mistakenly preconceiving that they might smoke a bit hot and airy due to the open draw. My fears were allayed each time, however. By this point in the smoke, each had settled in and were performing admirably. The earlier nuttiness fades around this point – although still present, it is muted in comparison to the first 20 minutes of the cigar. A faint, sweet lemon flavor presented late in the second third of each of my Garofalos. Think lemonade vs. lemon juice here; it’s not a sharp citrus flavor, but perhaps more akin to sour orange with its sweet and sour admixture. I found it to be an entertaining turn of events. 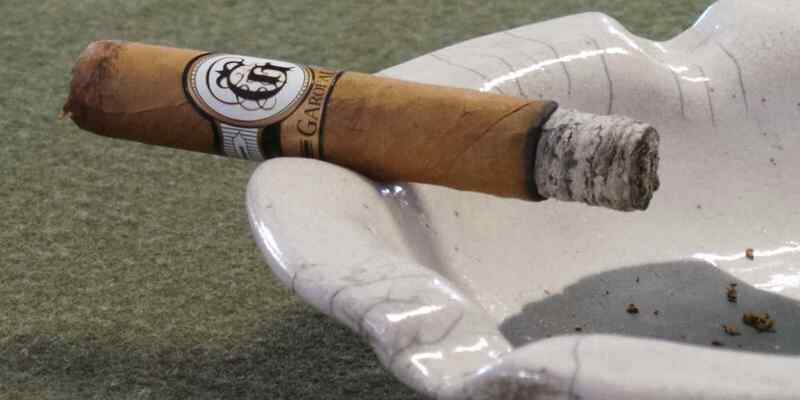 The cigars would continue to burn very well, holding an ash just past an inch each time before collapsing into the ashtray when I would place it on the cradle. The final portion of the Garofalo presented further development of the sweetness present at midpoint, and a return of a more pronounced nuttiness. A small amount of the initial spice reentered the playing field as well. For any coffee drinkers out there, I would again recommend trying the Garofalo with your café of choice. While it is a personal preference for me, I believe the combination really showcases the flavors of each. I am on record as not being the biggest fan of Connecticut wrapper leaf. In fact, there are precious few blends that I frequently reach for which carry it. I will, however, confess that the Garofalo has made the short list for me. The construction was spot-on, the interplay of nutty and sweet flavors quite pleasant, and the price is definitely refreshing in light of today’s plethora of $10+ sticks. If you’re a Connecticut fan, you’ll dig the Garofalo; if you aren’t you still just might….